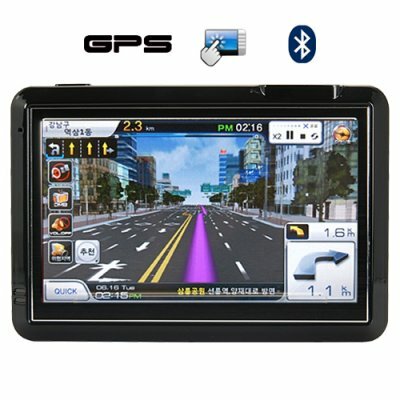 Successfully Added Portable GPS Navigator "GuideStar" - 4.3 Inch Touchscreen to your Shopping Cart. Portable GPS Navigator combining the turn-by-turn directions of modern GPS navigation along with a rich media enhanced operating environment to give you the best user experience possible. So much power in a handheld device. Introducing The GuideStar portable GPS computer and media player with 2GB SD card included free - transforming the way you travel! The Guidestar was designed to be versatile, yet rugged - to take with you anywhere, whether you're on crossing continents by car or hiking off the beaten path in the jungles of Peru. World Class GPS Device: The GuideStar comes with Windows CE 5.0, the mobile operating system of choice to run today's most popular GPS software titles. Load in your maps and experience amazing features like lane assist, voice guidance, 3-D views, intelligent route planning, and points of interest (POI). Feature-rich Media Player: This handheld wonder features a stunning 4.3 inch touchscreen TFT LCD screen to bring all your videos to life! You can play multimedia files like: XVID, AVI, MP4, MPG, MP3, WMA, BMP, and JPG saved on SD cards and USB thumb drives with the Guidestar. Lots of Extras: Not only is the GuideStar an award-winning portable GPS device and multimedia powerhouse, it is also a remarkable eBook reader, gaming machine, and mass storage device! You can even pair your cellphone to it. Then using the unit's FM transmitter function, output your cellphone to your radio speakers, and talk handsfree - how cool is that? Use it as a handheld or mount it in-car with the free car kit. The GuideStar also comes with a cigarette adapter, AC adapter, USB cable, and everything you need to use it straight from the box! It powers on instantly, comes with an incredibly responsive touchscreen and is compact enough to fit in your pocket! Be Smart - Add to Cart! Buy one for yourself and a couple more for your parents and relatives. Then stock up a bunch for your online store. Brought to you by the online leader in direct from China wholesale electronics - Chinavasion. First class portable GPS navigator! Very responsive 4.3 Inch Touchscreen! Lots of extra features like a touchscreen Equilizer, Date and Time Function, Calculator, Backlight, Unit Converter (length, mass, capacity, area, angles, power, pressure, speed, temperature), and many games too! If your GPS software supports Greek, then the display and voice language will be in Greek. Most map software comes with a wide selection of language choices, which means both the display and sound (voice) will be in your preferred language. However, you should carefully select and buy the map software that is best suited for your region of the world. Does this unit come with an SD card? Yes, this remarkable GPS Navigator comes with a free 2GB SD card. Το αγορασα προσφατα,και λειτουργει αψογα.Πανευκολο στη χρηση. Semplicemente Fantastico.......ci puoi caricare ogni cosa, molto intuitivo, provato sia Igo 8 fornito da loro che TomTom 7 e và benissimo. Il Gps è ottimo, aggancia subito il segnale e non lo perde mai!!! Ottimo anche il collegamento Bluetooth con il telefono.